My new favorite text editor is Atom Code Editor. 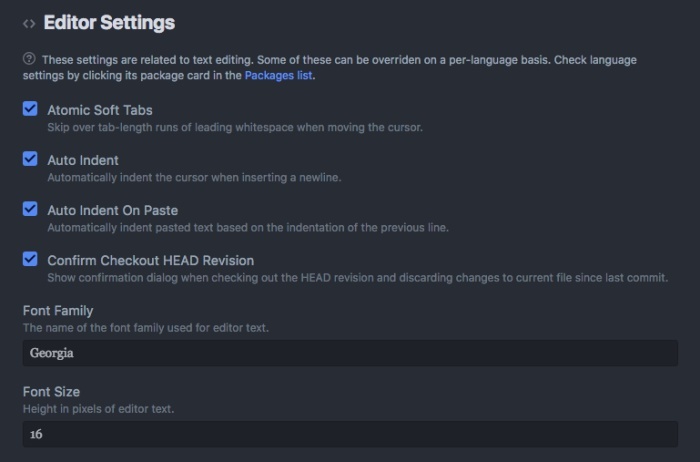 With Atom, you can modify the editor to fit your needs. I am going to show you a handful of tips and tricks that I use to make Atom work for me. You can customize fonts, font size and themes. Don’t like the default font? Is the size too small? You can change that. Enter a font name that you want to use. If you want to go a step further, you can edit Atom’s stylesheet. Atom comes with two default themes: Light and dark. If you don’t like them, you can install a new theme. Don’t know which one to install. Use Atom’s theme search to find your next favorite theme. Want to work faster in Atom? Use these keyboard shortcuts. Since, I use Atom on my Mac, the shortcuts are for a Mac. When you are writing code, sometimes you have to write the same line over and over again. Instead of copying and pasting, you can have Atom do the copying and pasting for you. Go to a line you want to duplicate. Press the keys CRTL + SHIFT + D. It copies and paste your current line. Repeat for as many times as needed. Have you ever need to rearrange some lines? Move one up from its current spot. Instead of cutting and pasting, you can use this shortcut to move a line up or down one. Go to a line you want to move. Press CMD + CTRL + UP (arrow). It moves your line up one row. If you want to move it down, use CMD + CTRL + Down (arrow). Different code can use different syntax for comments. You can use a shortcut to comment out your code. It will put the right syntax for comments depending on the language. You don’t need to remember to use the right comment syntax. Highlight the code that you want to comment out. Press CMD + /. Atom add comments to your code. Atom is a great text editor. I like that I can customize it to look they way I want by changing the settings or install optional plugins. Atom’s shortcuts help you to use it even more productively.